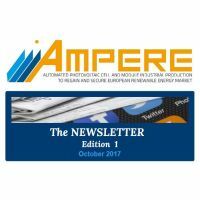 Our sister project AMPERE has released their first newsletter. In the newsletter you can find information on the objectives, the kick off meeting and the website of the project. As well as a paragraph dedicated to the sister projects: NextBase and DISC, both founded by the H2020 programme. Please find the link to the newsletter here.